Connectivity • Innovative Network Computer Solutions, Inc.
Technology advances are quickly integrating communications and IT into a cohesive, inseparable business catalyst. With so many options, the method by which busy executives strategize, source, implement and maintain their service providers is more important than ever before. The telecommunications landscape can be confusing, time consuming and unnecessarily expensive for those who don’t speak the language. Connectivity, compliance, security, uptimes and service levels are just a few variables to manage, and each varies from carrier to carrier and from company to company. Through our strategic relationships with more than 70 carriers and suppliers, INCS will help your IT department (or be your IT department) to ensure your carrier services integrate powerfully and correctly with your IT infrastructure and business vision. 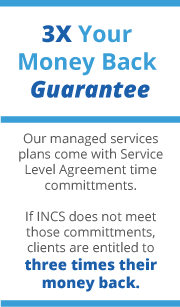 INCS can be your single point of contact for all carrier service-related issues: we’ll manage those resources so you don’t have to. Organizations operating in multiple geographic locations require employees, clients and vendors to function efficiently in a single reliable network. Wide area networks (WANs) empower remote stakeholders to communicate and collaborate securely through one network, as if located within the same four walls. Less expensive bandwidth has changed WAN technology significantly. MPLS, VPLS, Broadband, FTTC, xDSL, fiber, copper EFM, 3G or 4G, and point-to-point WANs: All serve a specific purpose and each has strengths and weaknesses based upon an organization’s geographic and IT infrastructure. INCS will help you make the right choice. Already made huge investments in legacy (private branch exchange – PBX) phone systems? Still want the benefits of converging all local and long distance phones systems and broadband Internet services onto one line? SIP trunking allows businesses to reap voice over Internet protocol (VoIP)-like benefits into legacy systems without investing in new infrastructure. Using SIP, you can consolidate all your communication systems, including data and voice into one bill and a single point of contact. Broadband service today is about more than just high speed Internet connections in the office; it’s about having a connection wherever your employees need it. Whether it’s digital subscriber line (DSL) or cable high speed Internet, Wi-Fi connectivity, or mobile broadband, not all broadband networks are not created equal. Each carrier has unique strengths and weaknesses depending on your business location, structure and industry. Which carrier service solutions are right for your business? Which carriers are best for your location, your business structure and your IT infrastructure? We offer a customer carrier services review to baseline your current voice and data costs, and to design and provide an overview of the cost savings and/or efficiency gains available through other providers.